The remnants of the foam layer of the layer makes a relatively small pile. As I was taking the foam pieces to the trash, I noticed that I could pop some of the track sections intact from the foam scenery. I used 1/8 inch plywood sub roadbed glued to the foam. I was able to salvage three turnouts from McCooks, a double crossover and a single turnout. Since I only need 9 more turnouts to finish my home layout, these will come in handy. Three turnouts salvaged from McCook's Landing. There is a perverse pleasure in taking a wrecking bar to your layout. Good thing I'm not a surgeon, look what I found under the foam layer! A nasty snowstorm followed by icy rain was a good reason to stay home this afternoon. As I was doing some chores, I noticed one of the switch stands on McCook's Landing had a broken solder joint. Instead of fixing it, I reached for my wrecking bar! Catalyzed by the broken part, I started the recycling process for McCook's Landing. Several months ago I had decided to recycle its benchwork into a different layout. While I don't have my new design figured out yet, I went ahead with demolition. Having thought about this for quite some time, it was very satisfying to actually being the work. Yes, I did feel a little like Sherman as he left Atlanta. Please note that I am NOT dismantling my home layout, The USMRR AQUIA LINE, only the portable display layout called McCook's Landing. I did save as much as possible, so Haupt will not be upset. As I removed the details, switch stands and most of the structures, I went around my home layout and looked for places where they might work. I think I can use just about all the structures. The figures will also come in handy. I did not bother saving any track. 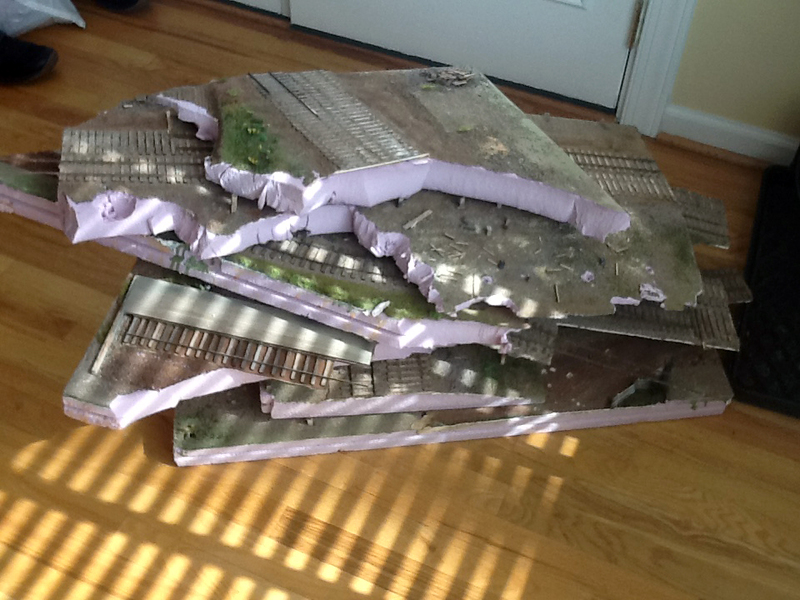 The turntable pit was solidly glued in and could not be removed. Unfortunately, the ship yard with the marine ways can not be used on my home layout. I was able to save the major assemblies, but the ship yard got scrapped. I also removed the lighting valance. Since this will not be an exhibition layout, the valance wasn't needed. It also interfered with many good photo angles. So I took it down. But the LEDs were a big success and I would consider using them again. I intend to raise the revised layout about 6 inches. This means the legs will be folded up, or maybe even removed. I have not decided what to do about the backdrop. It took some damage during the demolition process. Instead of fixing the damaged spots, it might be easier to replace it with two 8 foot sections. Some things I noted during demolition. It took longer them I expected as I plan to reuse the benchwork. So I had to remove glue globs, etc. The Liquid nails glue pulled up fairly easily. Carpenter's yellow glue was much harder to remove. By the most difficult stuff to remove was the polyurethane water surface, especially where there was sand at the shoreline. I started mocking up potential next layouts. This is an HO mock up using some of my military vehicles. I am not sure what the final layout will be yet. Things have been hectic here in Alexandria. While work on the layout has been on hold, many other projects are moving forward. I will post an update later. In the meantime, I wanted to mention that the Lyceum lecture series on the Civil War continues. As the 150th commemoration of the Civil War comes to a close, The Lyceum: Alexandria’s History Museum explores the end of the war and its aftermath through a series of lectures.